Do you know someone who spends far too much time forwarding emails? Do they email you the same joke repeatedly? Have they warned you multiple times that cell phone records go public today? Do they really deep down inside believe that Microsoft will pay them a nickel for every email they forward? If you answered yes to any of these questions, your friend may have a clinical addiction to email forwarding. 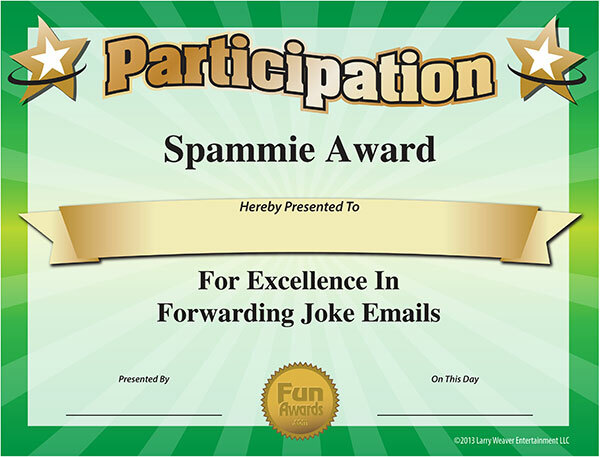 Show them you acknowledge their time wasting excellence with this free funny award. Download the certificate, type in their name, and post it on their office door or cubicle. Then send them an email warning that they must tell five people about the award today or else a Nigerian scammer will lose his kidney. Download 101 Funny Employee Awards Certificates! If you like this free funny award, be sure to pick up our 101 funny award certificates eBook. These awards are perfect for every worker at any type of business.